Anyone working in health care will remember how it felt to work with their very first patient. Fear, nervousness, excitement and even dread represent the broad range of emotions that novice health care providers feel as they enter the field. 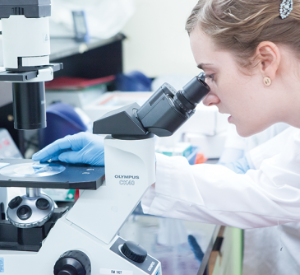 Clinical placements are often the first time Michener’s students get to work directly in a health care facility, clinic or laboratory. After months of simulation – where they work with patient models, manikins and simulated cases – students arrive at clinical sites ready for the opportunity to work directly in the health care system alongside clinicians and other health care professionals as they would after graduation. 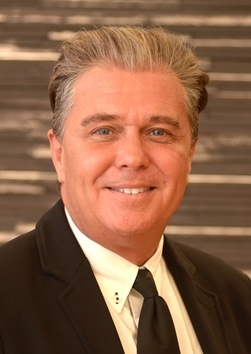 As the new president of St. Joseph’s Health Centre Guelph, David Wormald brings to the table extensive leadership experience, strong people skills and a proven ability to enhance organizational effectiveness and patient care. But he also has another attribute that can be hard to find among C-suite hospital executives: primary health care skills that he was practising up until 18 months ago, while already well into his management career. Fall is an exciting time for Michener’s Alumni Association. Saturday, November 14 is Campus Day, and the Alumni Association will be hosting its second annual Alumni Fireside Chat for prospective students. 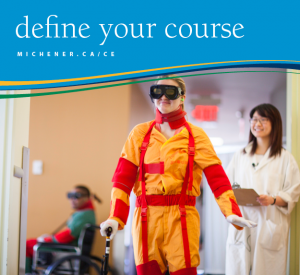 The Fireside Chat is an opportunity to share our perspectives of the programs offered at Michener. We’ll be discussing our professions and the Michener experience with future students. We’re still looking for volunteers to represent several programs, including Chiropody and Ultrasound. If you’re interested in volunteering, email alumni@michener.ca to sign up. With the help of fellow alumni, we’re looking forward to building on the successes of the last year. We’re inviting you to join us at Michener for the Annual General Alumni Meeting on Tuesday, November 24. This is a chance for alumni to hear updates from the Alumni Association on the successes over the last year. It’s also a forum to give the Alumni Board suggestions and feedback – let us know what you think the Alumni Association can do to engage its members. If you haven’t heard yet, the biggest news from Michener this year was the announcement of integration with the University Health Network (UHN). As UHN is home to many Michener alumni, the Alumni Association is looking forward having many ambassadors bridge these two institutions. We are enthusiastic that this partnership will create new opportunities to bring alumni, students, faculty and staff together – to nurture the growth of a diverse, yet close-knit Michener community. If you are interested in learning more about opportunities within the Alumni Association, please email alumni@michener.ca. We look forward to seeing you soon. Chitra Gnanasabesan (Respiratory Therapy, 1994) recently received the Colya Kaminiarz award from the Canadian Society of Respiratory Therapists (CSRT) for professionalism. This national award recognizes respiratory therapists who have made significant contributions to professional practice and/or have influenced others towards higher levels of achievement in professional practice. 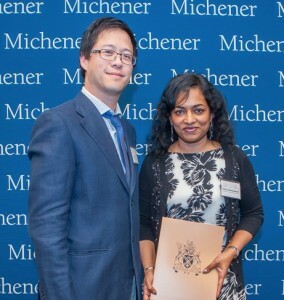 Chitra also received the Michener Alumni Association Scholarship at the 2015 Michener Student Awards Ceremony for her demonstrated leadership and accomplishments as a positive role model in the community. Ming Han (Genetics Technology, 2013) was recently awarded research funding from the Beatrice Hunter Cancer Research Institute in Halifax, Nova Scotia for his research in genetic biomarkers for multiple myeloma treatment prognosis. He will also be presenting his research at the American Society for Haematology at their annual conference in Orlando, Florida this winter. 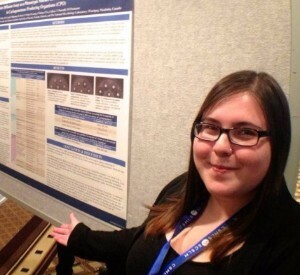 Elissa Faedo (Respiratory Therapy, 2014) was awarded with the Respiratory Therapy Society of Ontario (RTSO) Carestream Student Award for her outstanding professionalism during clinical training and contributions to a positive clinical environment. 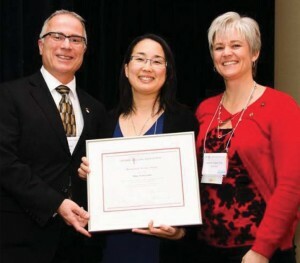 Dr. Mika Nonoyama (Respiratory Therapy, 1997) received The Lung Association’s Ontario Respiratory Care Society (ORCS) Meritorious Award for outstanding volunteer service. Dr. Nonoyama has been an active ORCS and Lung Association volunteer for more than 10 years and has served as co-editor of their editorial board. She is currently a member of the Research and Fellowship Committee. Please welcome Monique Barbeau (Radiological Technology, 1984) to Michener’s faculty! Monique joined Michener’s faculty in September 2015. While working full-time for Michener’s Radiological Technology program, she also works in the Forensic and Pathology Unit at the provincial Forensic Services and Coroner’s Complex as well as Mackenzie Health in Richmond Hill. 2007 Radiological Technology graduate and current Radiological Technology Faculty member Masood Hassan has successfully completed the Stepping Stones for Teacher Development program from the Centre for Faculty Development at University of Toronto, receiving a Continuing Education Certificate from the Office of Continuing Professional Development, Faculty of Medicine at U of T. The program is an opportunity for faculty to immerse themselves in teacher training and explore their roles as educators.